Once every three decades the year begins with a New Moon. 2014 is one of these exceptional years. The January 1, 2014 New Moon accentuates the Uranus-Pluto square, reminding us that we're in the middle of a big metamorphosis. 2014 will mark a watershed, we will remember this year for many decades to come. On January 1, at 4:14 a.m., Sun and Moon are meeting. 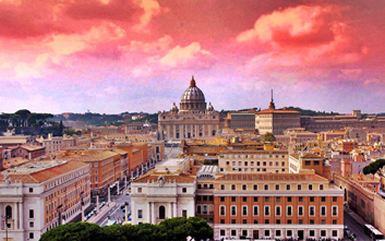 They're culminating over the city of Rome, making the 'Eternal City' the present center of the world. Rome is one of the birthplaces of Western civilization and it might be at center stage for the entire year. I'm not a Catholic, however when Pope Francis was elected on March 13, 2013, I felt moved and elated. I had hoped that the new pope would be South American. 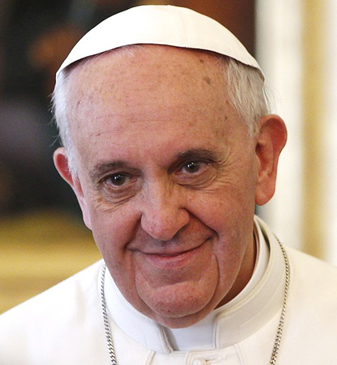 Pope Francis is a rare being, everybody loves him - and he genuinely loves everybody he meets. He walks his talk, he's a ray of hope for everyone on Earth. The Catholic Church is one of the oldest institutions in the world. Founded in the 1st century AD, it looks back at a two thousand year history. With more than 1.2 billion members it's the largest Christian Church. Its evolution is deeply interwoven with our Western culture. It has played a prominent role throughout the ages, inspiring art, culture, philosophy and science. Early on, the Church replaced the Roman Empire as a unifying force in Europe and the papacy has been involved in politics. Time Magazine honors Pope Francis as the 'person of the year'. An excellent article worth reading says: "What makes this Pope so important is the speed with which he has captured the imaginations of millions who had given up on hoping for the church at all." "His namesake, Francis of Assisi heard a voice calling to him to repair God’s house. He left his prosperous silk-merchant family to live with the poor. He was a peacemaker, the first Catholic leader to travel to Egypt trying to end the Crusades. He placed mercy at the core of his life." "Pope Francis sees “the church as a field hospital after battle.” His vision is of a pastoral—not a doctrinaire—church which embraces the poor, the spiritually broken and the lonely. “I prefer a Church which is bruised, hurting and dirty because it has been out on the streets, rather than a Church which is unhealthy from being confined and from clinging to its own security,” he wrote. He made it clear that he does not just want talk—he wants actual transformation." 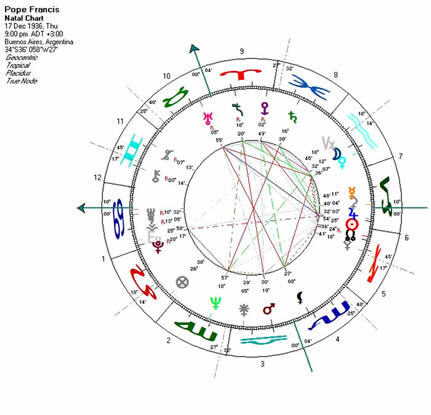 Pope Francis' astrological chart reveals a remarkably intelligent, loveable, and committed man. There are all the chances that his leadership might bring the Catholic Church back to what matters most - love and compassion. Indeed, his presence might trigger changes way beyond the Catholic world. Francis' loveable and non-judgemental nature captures the hearts of everyone he comes across, sending ripples through all religions and societies alike. After all, he says: ‘I believe in God, not in a Catholic God’. Francis is humility in action. "Reza por mí", he asks almost everyone he meets. Pray for me. Cancer is his rising sign, revealing someone who's in touch with his emotions - with a motherly instinct, deeply caring and nurturing. His birth ruler, the Moon in Aquarius is in the seventh house, in conjunction with Venus. This speaks of a socially active, altruistic and humble man who's genuinely curious in his fellow beings. There's gratefulness that God is so generous, giving him the chance to meet with the world. 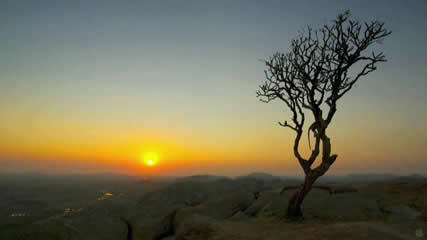 His inner contentment expresses in deep and non-judgemental love which showers on everyone he meets. Uranus in Taurus is at the zenith of his chart, in his career house, showing the impact he has on the world at large. Uranus is a rebel, a reformer. With his Moon-Venus conjunction in Uranus' sign, he could be called a revolutionary of the heart. He represents the highest manifestation of Taurean energy, the Hierophant, interpreter of sacred mysteries and arcane principles. 2014 is a 7-year (2+0+1+4). Integration of spirituality into our daily life will be the central theme. One of our modern world's key problems is schizophrenia. For six days we maximize profits, abuse mother nature and cheat our way through. And then, on the seventh we meditate, pray, go to church and donate. Humanity will only survive the 21st century if we manage to harmonize these two aspects. We have to remember that every moment is sacred, that the visible and the invisible are inseparable, two sides of the same coin. 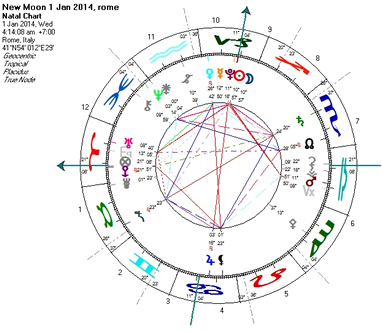 Pluto and Mercury are within a couple degrees of the January New Moon. Ninety degrees to either side are Mars and Uranus, lending their fiery wings, fueling the deeply inquisitive Capricorn constellation in hexagram 38, 'Opposition'. We're prompted to ask deep and difficult questions: What's wrong with our world? Why is there so much injustice, war, misery and famine? We might realize that we're all liable in some ways or other. Taking charge, feeling responsible is the breakthrough. It's empowering when we realize that we can do something about it, that our contribution counts. If we dare examine ourselves we will know how to improve and evolve. We're all struggling along to become more caring, honest, outspoken and socially responsible. And we all know from experience, there's no greater joy and fulfillment than assisting one another. It's deeply inspiring to feel the joy of our fellow beings when sharing what we know, feel and own, for it enriches our spirit. 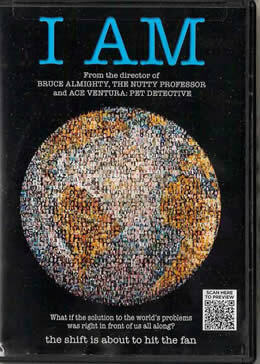 In this context I would like to mention the excellent documentary I AM, by famous Hollywood director Tom Shadyac. A terrible accident catapulted him to the very edge of life. Suffering from extreme sensitivities to light and sound caused by a post concussion syndrome, he prepared to go. He realized that his great success had in fact been a great failure. He saw that despite best intentions he had contributed to the destruction of this world. Wishing he could let everyone know of what he found, after many months of hell his health miraculously improved. Recovered to the point where he could travel again, he reached out to find answers to his burning questions. What great timing, entering the balsamic phase of the Moon two last days before it ends! What a rare synchronicity! Those amongst you, dear readers, eager to learn astrology - tune in to the vibe of these last two days, and you will know what balsamic means. Be it wrapping up loose ends, holding reviews, thinking back in time of what a wonderful, crazy, and at times probably dreadful experience this year has been. Consider all the inspirations you've received. And then, close your eyes, connect with the unborn inner potentials. It's impossible to know what the planted seeds will turn into, what color their flowers will be, what the sum total of who you are will become next. However, and that's another unique quality of the 'Crone', the old wise balsamic Moon: we may be able to bend around the corner, getting a feel for the future, of what's yet to be born - and feel evolution's pull to get us there... The Moon is void-of-course the entire day. Early morning the Moon moves across the Galactic center, still v/c, till 11 a.m. Then, the Moon crosses over into Capricorn, joining Sun, Mercury, Pluto and Venus. Naturally, there's some nostalgia in the air, the bitter-sweetness of approaching the end of a marvelous story. This is a wonderful opportunity to practice gratefulness and forgiveness - and be in this moment. Time is not linear, not at all, it just appears that way. Time, really, is psychological. Without memory there's just the Now. Memory is mind, a great archive, a storybook, a museum. The concept of time allows us to structure the archive; time is as unreal as a filing system. - New Moons tend to be peaceful, however this one could be an exception. Over-confidence may sneak in, there's the temptation to go too far to quick. Caution is advisable, maybe there's not yet enough information to draw conclusions. Happy New Year! Sun and Moon meet at 4:14 a.m. If anything, this is a day to celebrate. Be quiet, tune in to the delicate freshness of an empty canvas. Juno, the asteroid of relationships, of how we interact with one another, changes into Pisces, cruising through uncharted oceans till early March. Juno is not too happy in this fathomless vastness, easily feeling disoriented. Knowing this might help. As always with astrology - we will take things less personally. Blue Spectral Night is abundant like the star spangled night sky, full of mysteries and great stories. It also is very private, internally rich and very profound. The frequency of the eleven with its attribute 'spectral' indicates that a new element will be added, something new will merge with what is. Temporary disruptions are the ripple effects of such merger. As this is the first day of the year, this frequency will make the bass line for the coming 365 days. Void-of-course since early morning, the Moon changes into Aquarius by 10 a.m. A most interesting day, some new grand disclosure or other fascinating news could be unfolding. Watch out, the coming four weeks will bring the year of the Water Snake to completion. Snake's trademarks are radical change, leaving old skins behind and disclosure of secrets. Wikipedia says that 'by November 2013, the Guardian had published one percent of Edward Snowden's documents, with "the worst yet to come"'. We take risks when we break the silence. In our present time it's of paramount importance to speak up, to share our perception of what needs to be adjusted. This is particularly true when we cannot forget what we've seen. Closing our eyes to hurt and looking the other way when there's suffering is simply not an option anymore. A very rich time, lot's going on. Details we had overlooked earlier may come to light. However, this doesn't mean that we should change our minds. Nothing is perfect. Actually, imperfection is one of the main attributes of life. Were there no ways of improving, evolution would have reached a dead end road long ago. Combining flexibility and forcefulness, being keenly aware of the applied pressure may allow accomplishing goals against odds. The Red Cosmic Snake is intense, a gateway to both darkest underworlds and highest peaks. There's some danger to get lost in excess. Listen well, you might hear the voice of instinctual wisdom. Healing powers are readily accessible. At 10 a.m. the Mon enters Pisces. Every year on January 4, Earth comes closest to the Sun. It so happens that this year Jupiter is closest to Earth on this very same day. We won't see much difference in the Sun's brightness, however Jupiter is dominating the night sky. Around midnight it's right at zenith, where the Sun would be in early July. Grab a pair of binoculars, you might be able to see Jupiter's four larger moons! The White Magnetic Worldbridger has a deep and calm vibe. A great day to look inside and reassess your situation. All too easily we forget that nothing in this world is permanent. Everything comes and goes, there's constant change - and yet the essence remains, the eye of the cyclone is eternally still. Tuning in to this truth increases the appreciation of what the universe is treating us with right now. It also reminds us that everything we call ours eventually is meant to be passed on. When giving we create space for the new. The greater the flow of exchange the richer our lives will be. It's a natural law, for everything we give something will come back. Hoarding comes out of fear. 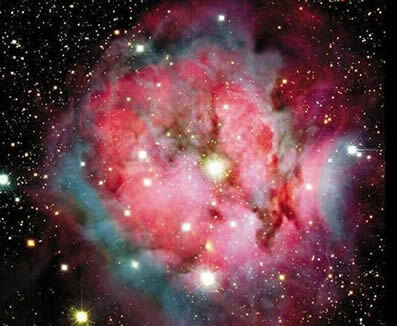 When we close off, alienating ourselves from the rest of the universe we become depressed. And our riches start rotting, what once was precious becomes a burden. The Blue Lunar Hand is the second day of the Worldbridger cycle. The imperative of these thirteen days is reaching out, intermingle and exchange.